"The freshest, deepest, most optimistic account of human nature I've come across in years." The most startling thing about disasters, according to award-winning author Rebecca Solnit, is not merely that so many people rise to the occasion, but that they do so with joy. That joy reveals an ordinarily unmet yearning for community, purposefulness, and meaningful work that disaster often provides. 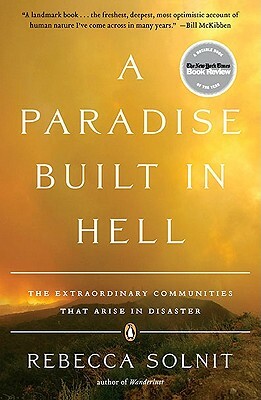 A Paradise Built in Hell is an investigation of the moments of altruism, resourcefulness, and generosity that arise amid disaster's grief and disruption and considers their implications for everyday life. It points to a new vision of what society could become-one that is less authoritarian and fearful, more collaborative and local. Rebecca Solnit is the author of numerous books, including Hope in the Dark, River of Shadows: Eadweard Muybridge and the Technological Wild West, Wanderlust: A History of Walking, and As Eve Said to the Serpent: On Landscape, Gender, and Art, which was nominated for the National Book Critics Circle Award in Criticism. In 2003, she received the prestigious Lannan Literary Award. "Thought-provoking . . . captivating and compelling . . . there's a hopeful, optimistic, even contagious quality to this superb book." "In her far-reaching and large-spirited new book, Solnit argues that disasters are opportunities as well as oppressions, each one a summons to rediscover the powerful engagement and joy of genuine altruism, civic life, grassroots community, and meaningful work." "Stirring . . . fascinating . . . presents a withering critique of modern capitalist society by examining five catastrophes . . . Her account of these events are so stirring that her book is worth reading for its storytelling alone. . . . [An] exciting and important contribution to our understanding of ourselves."